It’s been hard to write recently, for various reasons: or, at least, to write anything complex. (Notes on films have been stacking up on my ‘culture’ blog as a result of a “film moments” project that I started a few months ago.) Here on the next wave, drafts for posts have been building up, with elegant beginnings and no conclusions. So I thought I should get back into the habit by writing some simpler and maybe shorter things. Public health officials used to believe that we’d never manage to get the rate of adult smoking below 25%, according to a recent article by Clare Wilson in New Scientist (free, but registration required). Now, in a number of richer markets, it is well below that level: in the UK, it’s 16%, in the US, 15%. New Zealand plans to get its adult smoking levels below 5% by 2025, Finland by 2030 (this is a more aggressive target, since it includes chewing tobacco and e-cigarettes.) At its peak, in the mid-20th century, half of American and British adults smoked. The reasons for the decline aren’t hard to find, and they suggest that when public health interventions aren’t watered down as a result of governments caving in to aggressive commercial lobbying, they can be very effective. It is ten years since the England banned smoking in enclosed workplaces, including bars and restaurants. The combination of limiting the places where people can smoke, increasing costs through taxation, restricting sales outlets, publishing health warnings and banning advertising and other forms of promotion and endorsement turns out (who knew?) to reduce demand. One curiosity: there’s a split in the public health community as to whether e-cigarettes help people to quit or not. The US and Australia regard them as being almost as dangerous as ordinary cigarettes, while Martin Dockrell of Public Health England notes that they are 95% safer than smoking, and there’s no evidence of harm to bystanders. In the UK, the article notes, “vaping took off around 2010, and since that time the rate of decline in smoking has, if anything, slightly steepened.” But smoking rates are also falling in the US and Australia, where policy on vaping is less tolerant. The New Scientist article doesn’t draw wider conclusions, but I will. The first is that the long war of denial and obfuscation waged by the tobacco companies in the face of increasing evidence of harm may have shored up their profits for a while (a classic “Horizon One” response to change), but meant that they had lost all credibility and no influence once the public health evidence reached a critical mass. The second is that public health strategies can work to reduce public harm. Obviously, neo-liberalism would ignore such concerns, since it is effectively a political and economic strategy in which the state manages markets so that companies can extract profits. But in an age where neo-liberalism is discredited and political parties are moving beyond it, public health and public harm should be back on the political agenda. Denial and obfuscation will not be as effective as they used to be. 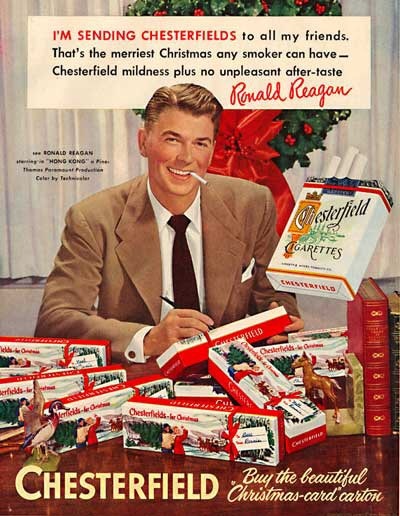 The image of Ronald Reagan promoting Chesterfields comes via the Stalin’s Moustache blog and is used with thanks.